Are translations just elaborate forgeries? 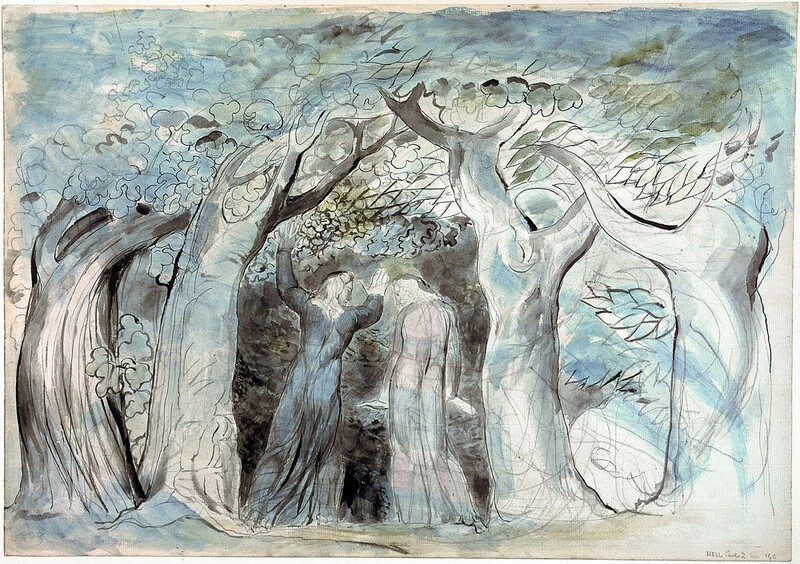 Dante and Virgil Penetrating the Forest by William Blake (graphite ink and watercolor on paper, 1824–7). One of 102 illustrations Blake created for The Divine Comedy, this work now hangs at the Tate. The Babel fish, which “telepathically feeds on brainwave energy,” is one of the more ridiculous examples of a universal translator in fiction. But it is also one of those wonderful instances of an author imagining a solution (in this case willfully absurd) to a problem that real-world technology appears to be catching up to. It’s not too far-fetched to imagine a day when more evolved versions of software like Siri and Google Translate (or, yes, Babblefish) combine to make instant translation possible. If it does come to pass, it’s safe to say it won’t look anything like a Babel fish. Maybe it will be a standard feature on everyone’s iPhone 29. Perhaps it will be an organic microchip infused biologically in our ears and/or brains. Or maybe it will be more along the lines of C-3PO, probably the most famous universal translator of all. Of course, the salient point about C-3PO wasn’t that he was “fluent in over six million forms of communications,” but that he was an autonomous artificial intelligence capable of real emotion; his translation skills were just an app that came pre-installed on him. Must we wait for C-3PO–level artificial intelligence to enjoy instant, free-flowing communication among any and all languages? It can’t be that hard — can it? Let’s back up a bit. Focusing on language barriers kind of misses the forest for the trees; translation from one language to another is just one specific instance of communication. The truth is that even when communicating in the same language — speaking or writing in one’s native tongue to a fellow fluent audience — a magical process similar to that of the unlikely Babel fish is occurring for real. Every time we speak or listen or write or read, we are either reading someone else’s mind or enabling others to read our own, relying entirely on “brainwave energy.” Unfortunately, this mind-reading ability is as imperfect as it is miraculous. Think of how common simple misunderstandings are in everyday life (like misreading the message and tone of a work email, for instance). Even the most mundane interactions can introduce unintended ambiguities. Then consider all the ink spilled debating what Hamlet’s deal was or what the ramifications of a scene from the latest Game of Thrones episode might be. (Actually, GoT is a doubly useful example since the show is a visualized interpretation of the books.) Difficulties and differences in interpretation of meaning persist even when translation isn’t necessary, particularly as the complexity of what is being communicated increases. Forget the Babel fish: someone should first invent a gadget that facilitates communication within the same language so well that the game of telephone becomes obsolete. A great and distressingly realistic cartoon by Tom Fishburne. Check out more of his work here. It seems the more we consider the awesome complexities and nuances of language, the less confident we can be in the objective reliability of any future translator app. This becomes more evident when considering how Google Translate actually functions. Rather than rendering literal and figurative meaning from one language to another the way we might imagine a monastic scholar would go about it, it’s actually more akin to Google’s search engine technology: Type in any phrase to be translated and Google Translate simply assumes that those words have been said before and sends its spiders a-scouring for an existing text with a side-by-side translation. In other words, rather than “translating” anything at all, Google Translate searches through a growing library of existing translations. Not to discount the brilliance required in constructing such a service, but this is a far cry from the creation of an artificially intelligent U.N.–caliber translator. Furthermore, it’s hard to get a precise count, but it seems that Google Translate currently enables back-and-forth translation between 58 languages, which entails 3,306 possible directions from one to another. For a universal translator to incorporate the roughly 7,000 extant human languages, 48,993,000 possible directions would be involved (7,000 x 6,999), a task that sounds just a tiny bit more challenging. Still, as Google digitizes more and more of the vast known published utterances of the human race (to be sure, a worthwhile endeavor that is largely underappreciated), the more likely Google Translate will be able to find a hit right along with its existing translation. But this solution merely begs the question: The power to pull up existing translations does not guarantee the integrity of those translations, let alone establish the plausibility of “authoritative” translation among the world’s thousands of languages. The true obstacle is not in how to design the software but that the problem it’s attempting to solve might be too complex (similar arguments are gaining traction regarding artificial intelligence and “mapping” the brain; it appears we are nowhere near as close to these breakthroughs as some of the more zealous predictions out there would have us believe). If communicating in the same language is so fraught with misunderstanding, translating each language into every other language would naturally be orders of magnitude more challenging, except maybe for your more basic queries (e.g., “Please point me toward the nearest non-disastrous restroom.” or “Garçon, may we please defile this meal with your finest ketchup?”). Also, countless published language-to-language dictionaries are presumably now included in Google Translate’s search set. But once we get past the low-hanging fruit of common, utilitarian phrases and approach more complex and infinitely variable material, two different polyglots translating the same content would likely produce two starkly different results, with no objective key to determine who is more “correct.” In fact, the same translator might produce different results on different days. The conflicting results could each offer plausible interpretations and successfully convey the essence of what’s being said, but who would be the arbiter of that? “All theory is gray, but green grows the golden tree of life.” Those lapidary words were written by Goethe. Or were they? I don’t speak German; we’ll just have to trust that someone properly transcribed him into English that time. But whether those words really were Goethe’s or were merely an inspired fantasy of a fraudulent translator, they hold one of life’s invaluable lessons: “All theory is gray, BUT…” We can sit and discuss our theoretical schemes till we’re blue in the face, but colorful, capricious reality will always intrude. This lesson is timeless. It is sure to resurface in the quest for constructing anything approximating a universal translator, and certainly in artificial intelligence as well. Mathematics is a language, but language is not math. Indeed, the arithmetic of translating between even just two languages does not add up. To begin to understand why, keep in mind that it’s not possible to quantify the number of words in the English language. Estimates range from a quarter of a million to a million words — but first we’d have to agree about what counts as a distinct word. “Run” has at least 645 distinct meanings, the most of any English word. Should all of them count separately, or should the three-letter sequence of “r-u-n” count but once? This multiple-sense issue is just one of the many conundrums in quantifying the English vocabulary. The impossibility of counting its total words notwithstanding, by way of comparison, English is often claimed to have about twice as many words as other Romance languages. Even if such a precise calculation were possible, why should we care? The average person’s vocabulary nowhere near approaches the full extent of a language’s complete inventory of “official” words. Such an accounting is largely meaningless, except for helping to point out one fact: As the arithmetic dictates, if every language has a different yet precisely unquantifiable stock of words, then most languages have words that do not exist in other languages. My favorite example in this game is the Japanese word tsundoku, which has no precise counterpart in English but can be translated as “the act of accumulating books faster than they can be read, so that they pile up.” Amazon.com is the biggest enabler of tsundoku the world has ever seen, the Kindle its penance. When linguists and philologists analyze these interesting discrepancies, revealing patterns emerge. For instance, compared to English, some languages have richer taxonomies of emotion — and the same goes for words describing odors. Such differences guarantee that with many words and even “simple” phrases, transcribing one language to another does not entail consulting a reference manual where varying vocabularies maintain a straightforward 1:1 ratio. That a word lacks a single counterpart does not make it “untranslatable”; it just means it would demand more than one word to convey the same thought. But as the need to make subjective decisions increases (more words = more ideas), so too will disagreement over the integrity of varying interpretations, even in a perfect world where every translator individually strives for unassailable accuracy — which, as we’ll see later, is not always the case. Again, for many purposes, existing tools and their inevitable progeny will do wonders for inter-language communication, among tourists and business travelers for instance. But these questions attain greater significance when considering literature, and especially poetry, in which every word does far more work on multiple levels (meter, sound, consonance, assonance, rhyme, ambivalent meanings). When reading a literary translation, what exactly are we reading? Whose work is it? And how should we choose one particular translation when presented with multiple options, if we aren’t fluent in the original language? Is every translation basically a verbal forgery? For the humanities and beyond, this is no small thing. The act of translating a work, and the fact that certain translations gain traction while others languish, can have huge cultural ramifications. Think of the Bible alone, from second-century Greek to Luther’s earth-shaking German translation to the momentous King James version a century later. Going back even further there is Homer, casting his long shadow over recorded human history, although we have no idea who he was or whether the works we have are even the result of one person’s efforts, rather than the culmination of a long oral storytelling tradition, or a mix of the two. For those of us unlettered in ancient Greek: which translation should we favor? Chapman’s comes recommended. Or perhaps one from this decade would be more appropriate? For a more recent example, consider the scholarship into what some call Freud’s mistranslation into English. In Freud and Man’s Soul, Austrian psychologist Bruno Bettelheim caused quite a sensation by arguing that English interpretations of Freud had gotten him all wrong, falsely attributing to him a clinically exacting, faux-scientific style in place of his original work, which relished in far more literary, philosophical language. Freud is considered one of the main shapers of our modern culture, so heavily assimilated into our thinking that we don’t even notice his influence; could a significant portion of that influence be based on misleading English translations? Everywhere we look, our cultural heritage seems to have relied on the work of translators, who may or may not be reliable. In everyday interaction during travels to a distant land, little discrepancies wouldn’t much matter. But the question of a translation’s integrity takes on much greater important in literature. Consider just one more mind-boggling example, one of the high-water marks of Western Civilization and what is widely considered the opening shot of the European Renaissance: The Divine Comedy. Of Dante’s masterpiece I’ve read only the first cantica, The Inferno. Or have I? For reasons long forgotten, I chose the translation by Henry Wadsworth Longfellow (mine is a richly annotated paperback on the Barnes & Noble imprint; the Longfellow text is also available online in full.) The upshot is that I’m not 100% sure I can say I’ve read The Inferno; it seems more likely that I read a second-hand (though artful) version of its plot. But such a work is more than just its plot. The Divine Comedy is famously composed in terza rima, a demanding meter sometimes asserted to have been invented by Dante for his epic; however, it appears that he wasn’t its creator but instead the first to use it in an extended work (still an impressive achievement, and a self-conscious one). His original Italian consists of 11-syllable lines incorporating chain rhyme. Longfellow switched from Italian’s standard hendecasyllabic lines to English’s standard pentameter, which is natural and defensible, but he also chose to abandon rhyme altogether. Who can blame him? He wanted to get the meaning “right.” But isn’t the musical rhyme kind of integral to the original’s reputation? Perhaps Longfellow decided that Anglicizing Dante’s terza rima was an impossible feat, or maybe he felt it wouldn’t sound as mellifluous in English because its rhymes are more limited than Italian’s, or maybe he just didn’t feel like going to all that trouble. But English versions of The Divine Comedy in terza rima do exist. Dorothy L. Sayers, the poet and erstwhile copywriter who with artist John Gilroy created those iconic Guinness ads from the 1920s and ’30s, translated the entire Comedy into English while retaining the integrity of the original rhyme scheme. Of the 100-plus English translations, other well-regarded attempts have also followed Dante’s rhyme. Regardless, the more interesting fact is that there are over 100 English translations of The Divine Comedy, and they keep coming. Three new English translations were released last year (two of which, including one by Dan Brown, were of The Inferno only). Presumably there will always be more on the way as long as books are being published. So, could I have picked a better version of The Inferno? Can there really be an answer to that question? Based on both accuracy and beauty, both of which are more subjective than any critic can allow, how could anyone identify a single “best” translation, or even the upper tier of translations? Could authorities agree on the top ten? Could we even agree on which authorities get to vote, kind of like the Baseball Hall of Fame? How can we trust the judgment of scholars and critics without having read the original ourselves? “Abandon all hope, ye who enter here” indeed! (Interestingly, that famous line from the poem is frequently mistranslated as “Abandon hope, all ye who enter here.”) Seven centuries on and Signor Alighieri still ignites the passions, even in internet comment threads. I don’t regret choosing Longfellow’s beautiful work. He was a brilliant poet and he sacrificed Dante’s rhyme only because of his honorable dedication to the Italian’s strict meaning. (Yes, yes, we’ve established that finding an “exact meaning” is a futile endeavor, but a translator always must try!) Knowing as we do about the problems of interpretation even within a single language, reading multiple translations might be the next-best way to get close to the original. Or maybe it would save time to learn Italian. Really, it’s a wonder that anybody dares to translate anything at all. For a charming illustration of how contentious this rough-and-tumble corner of the literary world can get, see Kevin Mahnken’s essay in Humanities on the most renowned translators of Russian literature into English. At one point Mahnken relates the story of Vladimir Nabokov’s grudge against Joseph Conrad, whose estimation of a popular early translation of Tolstoy’s Anna Karenina superseded that of the original Russian, which offended Nabokov irremediably. (Take his word for it: “I shall never forgive Conrad.”) If two of our greatest prose stylists can hold such irreconcilable views about a single translation and original text, what hope is there that we can trust any interpretation at all? For readers whose OCD has them intent on obtaining the “best” translation of anything, it’s refreshing to hear this point made by such an expert. We can stop looking for a definitive translation; such a treasure cannot exist. There is never a right answer, nor can there be. Or can there? Let’s return to that pugnacious Conrad-resenting genius, Mr. Nabokov. Whatever inherent imperfections may be present in all translations, his works will forever serve as exceptions, because we know that he personally translated all his earlier Russian stories; it hardly makes sense to harbor doubts about a translation written by the very author of the original. Discounting for the fact that linguistic nuances must be sacrificed in any translation, we can be sure that the author’s intent and style were retained to the fullest extent possible. Another reason we can be sure of this is the fact that Nabokov was exceptional in another remarkable way, namely that his finest works were written in English after already cementing himself as a leading Russian writer. Indeed, Russian wasn’t even his first language — it was French. The man slipped into different languages the way ordinary people order a new drink. Nabokov’s unique position as an unmatched polyglot and stylist provides an excellent case study for linguistics and even neuroscience. His experience in writing his autobiography, Speak, Memory, seems to substantiate research showing that language dictates how we think (rather than vice versa). By the time he was ready to write his memoirs, he was predominantly working in English, and this project was no exception. But when it came time to translate his finished autobiography into Russian, this switching of languages in his mind unleashed a flood of memories that had been inaccessible. As a result, he abandoned the English draft altogether and started a new autobiography from scratch, this time writing in Russian — and remembering more and more along the way. He then translated that second, more richly remembered version back into English, which is the version English readers have today. By all accounts, Nabokov did not lack confidence. But he had the humility (OK, it may have been false rhetorical humility) to recognize that Pushkin and his readers might not have liked his translation very much, or that he should at least acknowledge the possibility. Again, unlike the characters in that Bulgakov story, we can at least be certain that thanks to his inimitable gifts, Nabokov was quite happy with the translations of his own work. Alas, for all the more earthly authors who lack his talent and multilingualism, this isn’t always the case. But even if a writer must put his or her faith in a translator, the results are often happy, and it’s these examples that give us hope. The Magic Mountain is a very German book, and that might be the reason foreign critics very much underestimated its universal appeal. A Swedish critic, member of the Swedish Academy, with a decisive voice in the Nobel Prize awards, told me in public, and very decidedly, that nobody would dare to venture a translation of this book in a foreign language, as it was absolutely unsuited to such a purpose. That was a false prophecy. The Magic Mountain has been translated into all the European languages, and, so far as I can judge, no other of my books has had an equal success. Since Mann was more than happy with the results, we should be too. Right? It’s nice to think so, but unfortunately translation can never be so simple. Fortunes turn over time. Lowe-Porter’s rendition apparently fell out of favor among critics for certain lapses and questionable decisions. It seems that even a close personal partnership with the author couldn’t prevent all errors. Still, for English readers, knowing that Mann had a hand in it surely makes Lowe-Porter’s translation a solid place to start. But it does reinforce the notion that, like experts Richard Pevear and Larissa Volokhonsky, we too shouldn’t believe in definitive translations, but should recognize instead how new translations prove that a work remains alive. Imagine a future with artificial intelligences (for our purposes let’s pretend they’ll remain peaceable). Who’s to say some publisher or interested humanist won’t instruct some AIs to farm out translations of the best that’s been thought and said — and who’s to say individual AIs won’t disagree among themselves on certain renderings of poetry in various languages? “It is a wonderful thing.” Yes, truly it is. Inter-language communication might never be scientifically perfect. But so what? There hopefully will come a time when an app or device or a C-3PO will enable passable instant two-way communication faster than we can look up “beer” in an English-to-Mandarin pocket dictionary. As for the heavy hitters of world literature, translations of their finest work can still achieve astounding beauty, and even flawed forgeries can be illuminating. We’re all barbarians to somebody — and every brain’s a Babel fish. So all hail the human translators as they quietly, thanklessly, try to inch us all toward greater understanding.